THIS IS SPECIAL !!!!!!! This beautiful old window has outlived its original frame, and been placed in a Pine frame for shipping and display purposes. It was removed from an Old property in YORKSHIRE during refurbishment. 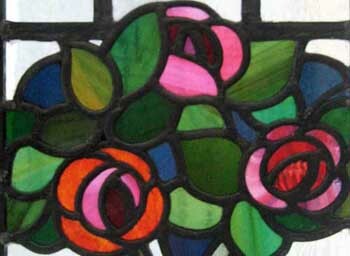 THE COLOURS DIVINE - PINKS REDS GREENS BOTH THE GLASS AND LEADS ARE IN EXCELLENT CONDITION. The frame measures 16"w x 55"H . The glass measures 13 " x 52"
Shipping and packing for USA would be $299 Including full insurance for loss and damage. You can buy this now using the paypal link below the photograph or e-mail sales click here to arrange payment by personal check ,money order or bank transfer.